Our range of products include horizontal double spindle oscillation mortiser. We are the leading and prominent Manufacturer of Horizontal Double Spindle Oscillation Mortiser. 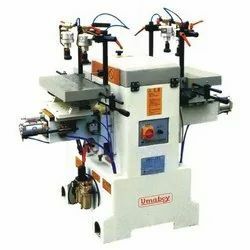 Two table built in front and back of the machine provides high efficiency mortising operations. Air clamp provides convenient work piece handling mortising width is adjustable. Air clamp provides convenient work piece handling mortising depth is adjustable. Can trialed control panel provides convenient operation.